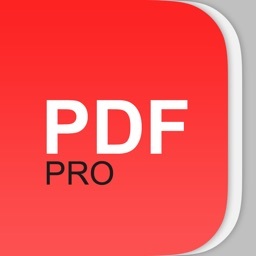 For TV and film production, this iPad app lets you to annotate PDFs and transfer those annotations. 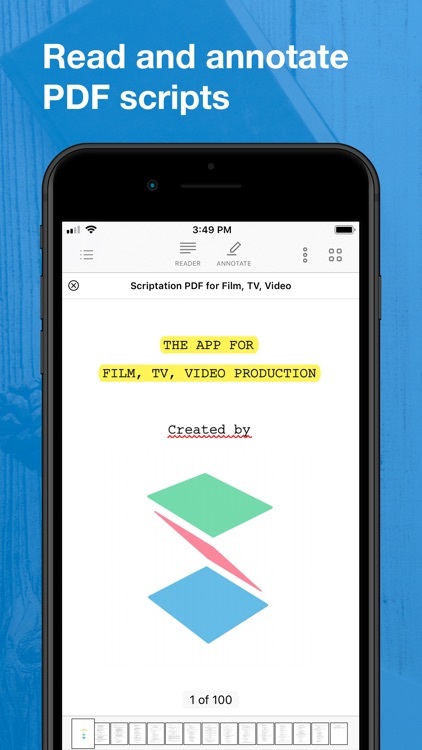 Scriptation for iPad offers a complete toolset with the most common annotation types, options to preview, bookmark, and search, simple sharing via email, text message, or AirDrop, and folder and document management with Dropbox, Google Drive, and Gmail. 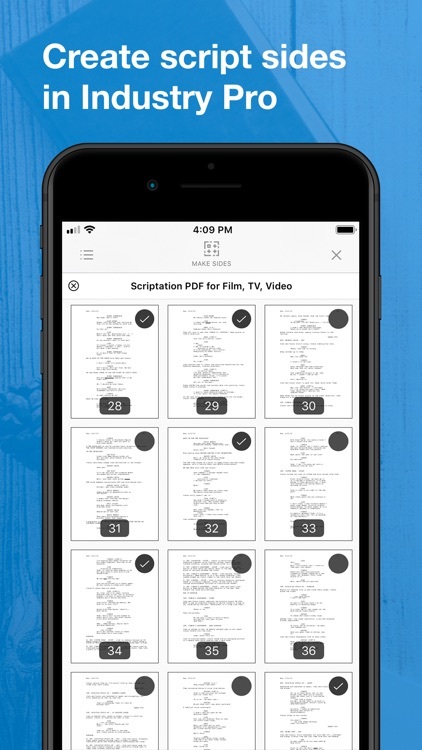 Scriptation is a simple-to-use tool for those in the television and film industry. 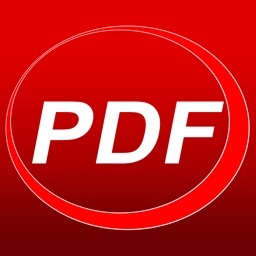 You can annotate PDFs and share the script changes easily and then use the full-featured app to manage your documents. 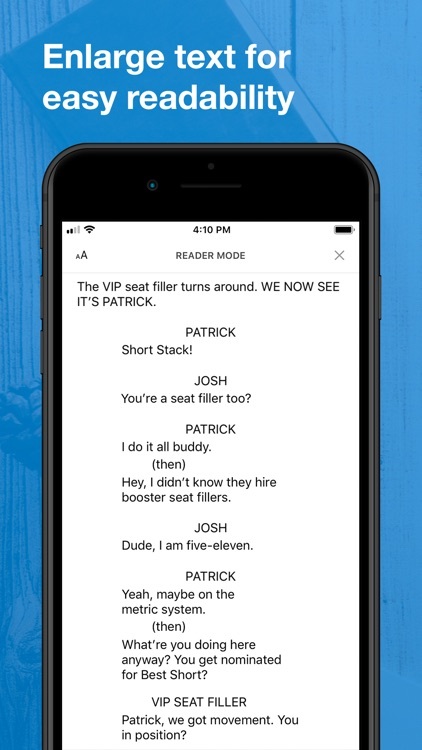 Endorsed by Rainn Wilson of “The Office,” Michael Spiller, director of “The Mindy Project” and Alex Reid, writer and director of “Malcom in the Middle,” you cannot go wrong with this script-change tool. 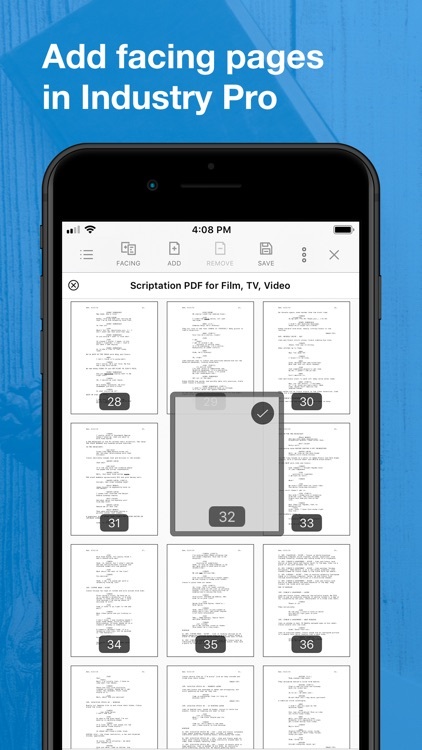 Read, annotate, and transfer PDFs and documents for simpler script changes using Scriptation for iPad..
Scriptation, the PDF annotation app for film, television, and video production, is the ground-breaking app that can intelligently transfer annotations between script revisions. 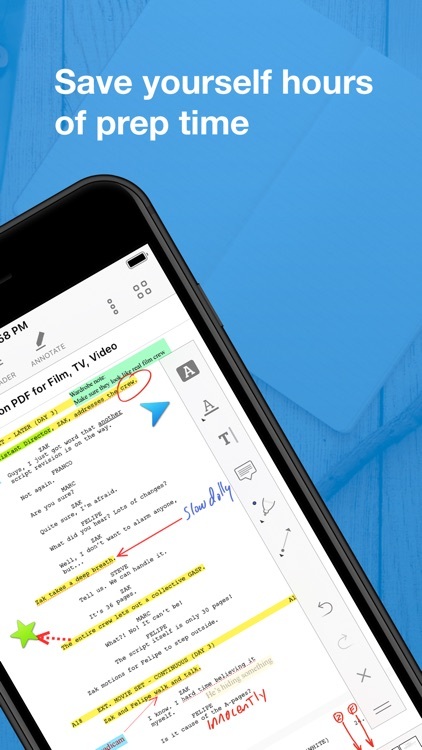 Whether you're a crew member on a big budget feature or a student working on your first production, Scriptation saves hours of time collating scripts and re-writing notes by hand. 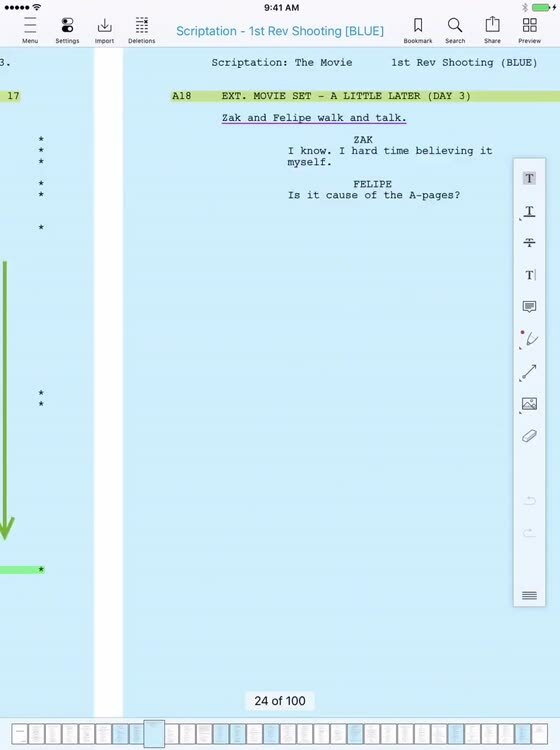 If you’ve ever had 30 revision pages on a 40-page script, you know how time consuming and tedious it is to copy your notes to new script pages.Scriptation’s proprietary note transferring algorithm, transcription, analyzes script changes and transfers every note to its corresponding location in the next draft in literally seconds. Pen and paper, meet stylus and tablet. 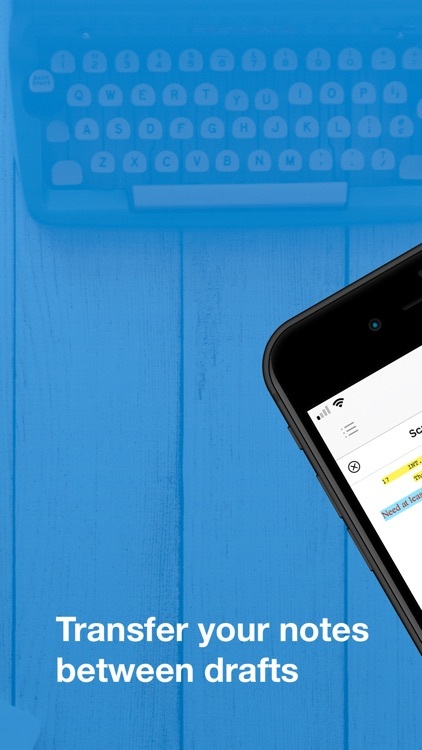 Scriptation offers a full set of annotation tools that allow you to highlight text, type notes, add photos, insert stickies, record sound, and more. You can finally get rid of that 3-ring binder. 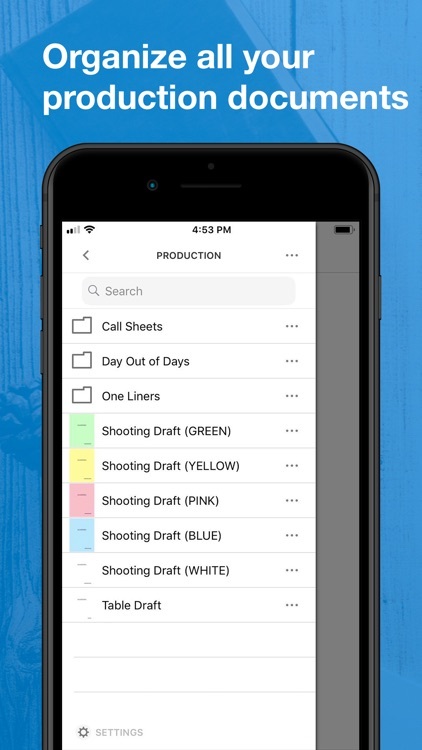 Scriptation gets you organized by keeping all your scripts, call sheets, schedules, and production documents in one place. How many times was that thing mentioned in the script? Scriptation’s search tool lets you find exactly what you’re looking for. Instantly search for text or even search your own annotations. Shockingly, there’s a better way to remember a page than by crumpling the corner of a paper script. 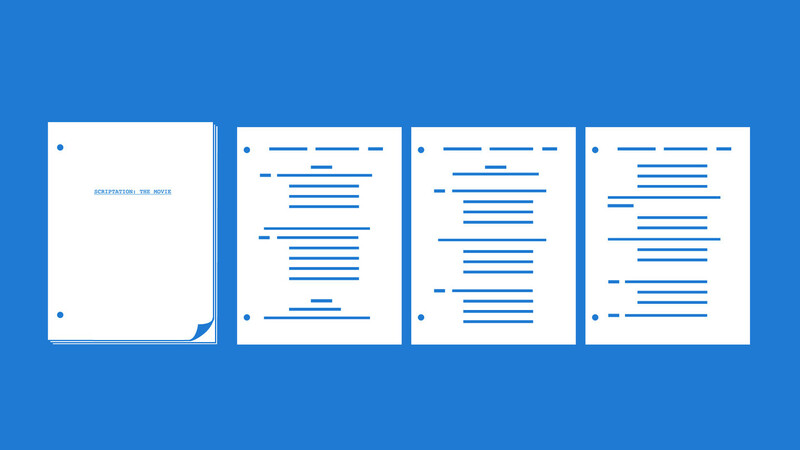 Scriptation lets you bookmark pages individually and view them all at once. 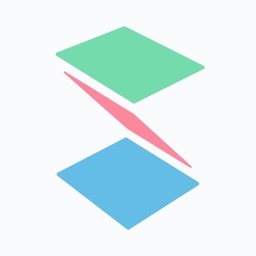 Want to separate notes based on meetings? Or share your thoughts with your department? 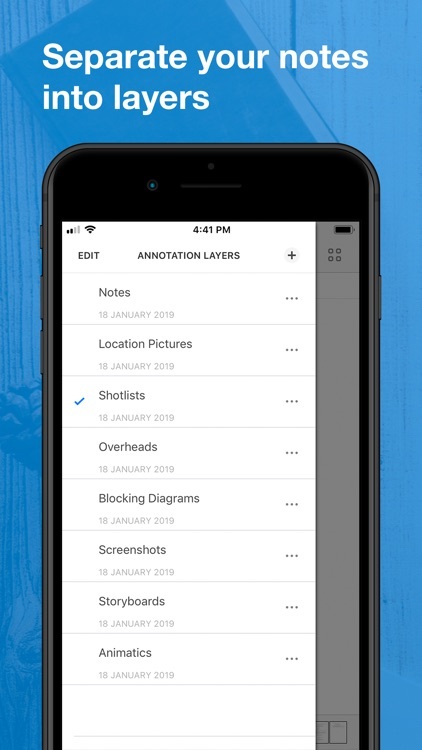 Scriptation’s annotation layers makes it easy to toggle between your notes. 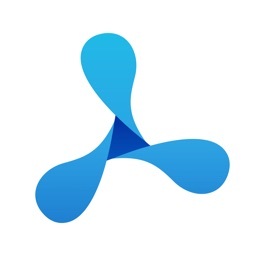 Sync between devices by connecting to cloud storage providers including iCloud, Dropbox, and Google Drive. 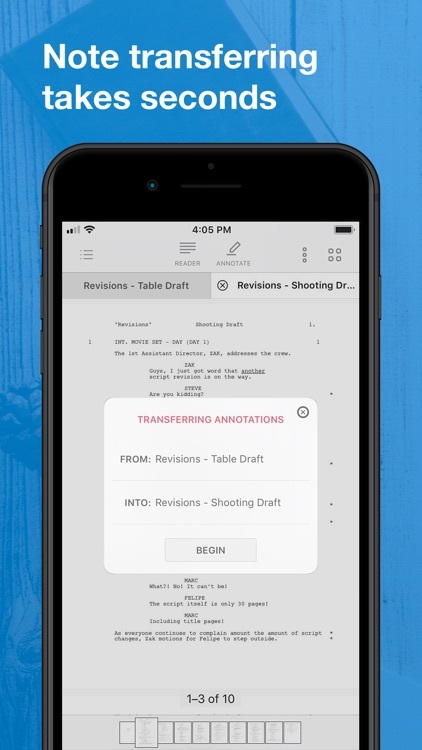 Scriptation preserves layers, actor highlights, and inserted pages. That table read script isn’t going to highlight itself. Or is it? 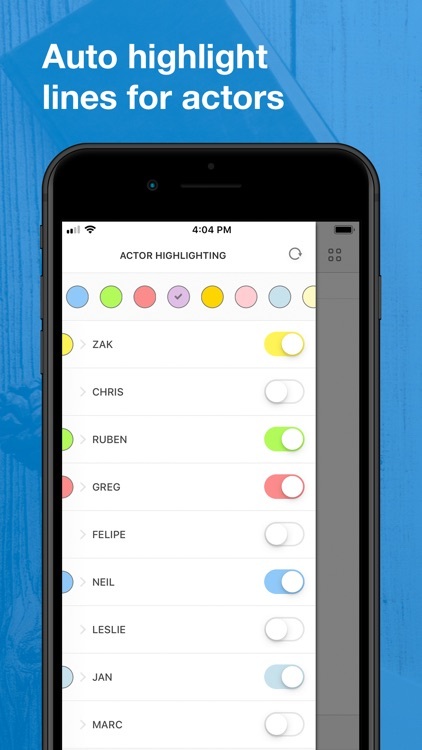 Built for actors but customized for sound mixers, Scriptation automatically highlights character lines with the tap of a button. Scriptation Industry Pro is an auto-renewing subscription service that gives you advanced features (including cloud sync, page maker, and sides tool) used by industry professionals. Scriptation Industry Pro has 1 Month, 6 Month, and 12 Month subscription options. For limited time offers, standard pricing will be automatically initiated for the next subscription period. For offers that include a 7-day free trial, after the free trial period you will be automatically renewed to the current subscription price which you can cancel at any time. The 1 Month subscription costs $7.99 USD every 1 month. The 6 Month subscription costs $35.99 USD every 6 months. The 12 Month subscription costs $59.99 USD every 12 months. Prices are subject to change. 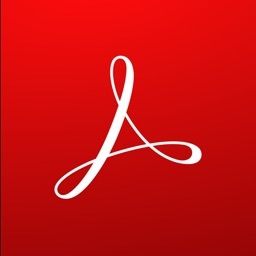 Scriptation Industry Pro automatically renews unless auto-renew is turned off at least 24-hours before the end of the current period. Your account will be charged for renewal within 24-hours prior to the end of the current period. Payment will be charged to your iTunes account at confirmation of purchase. You may manage Scriptation Industry Pro subscriptions and turn off auto-renewal by going to your Account Settings after purchase. Any unused portion of a free trial period will be forfeited when you purchase a Scriptation Industry Pro subscription.